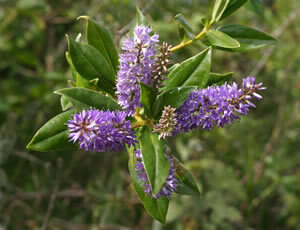 Hebe ‘Autumn Beauty’ forms a rounded, evergreen shrub, which can grow to 5 ft (1.5 m) high. The shiny green leaves are spear-shaped, 1.75–2 in (4–5 cm) long, and 0.5 in (1.25 cm) wide. The flowers are blue-mauve and appear in late summer and into the autumn. A hebe tender in the UK. Hebe ‘Autumn Beauty’ is a seedling from Hebe ‘Fragrant Jewel’ and was introduced by the nursery Scotts of Merriot, Somerset, UK.